The day government office Wyndham Grand Plaza Royale Hotel Chengdu is located in the western city of Chengdu modern industrial Hong and high-tech Industrial Park West, is the path to the west of Chengdu, the main tourist attractions, the day government office Wyndham Grand Villa Hotel Chengdu by Wyndham Hotel Group International Management. With elegant and comfortable guest rooms and Suites, the smallest room area of 40 square meters, the supporting facilities, to meet the needs of passengers. Hotel ad hoc four executive floors and an executive lounge, offers luxurious accommodation enjoyment and meticulous service, Chengdu day government office Wyndham Grand Plaza Royale Hotel La Vie En Rose - full-time restaurant, all-weather provides a la carte menu and buffet, an international flavor dishes and all kinds of flavor and healthy food; a state banquet in the palace - restaurant, with 32 private rooms and spacious hall, to provide top of Sichuan and Cantonese cuisine; loose House - Japanese restaurant, design unique Japanese restaurant with personalized Teppanyaki counter, saki and sushi bar. Two Japanese style tatami rooms and 1 Teppanyaki room for you to provide private banquet space, Chengdu day government office Wyndham Grand Plaza Royale Hotel tea garden - teahouse, decoration very modern style of wine & Cigar Bar for business people to provide comfortable and enjoy the space. 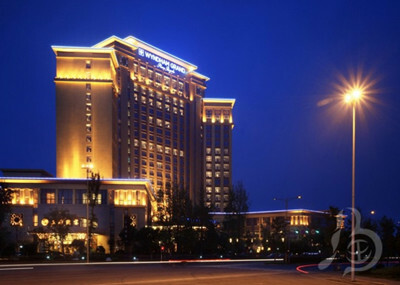 Four seasons grand banquet hall decorated noble elegant, can accommodate 800 people at the meeting. 13 different combinations of conference rooms are equipped with top conference facilities. Hotel training well equipped conference service team, for the guests to provide tailor-made all kinds of meeting service, Chengdu day government office Wyndham Grand Plaza Royale Hotel guests ad hoc the fitness and entertainment facilities, including a fitness center, indoor heated swimming pool, table tennis room, chess (mahjong) of the housing, spa and KTV Club. We look forward to your stay!